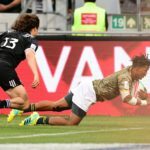 Dewald Human says he is satisfied with the Blitzboks’ growth during the first two tournaments of the World Rugby Sevens Series. Blitzboks star Dewald Human has voiced his support for the inaugural Schools Sevens tournament that will take place from 5-6 October in Johannesburg. DYLAN JACK reports.